Since "inheriting" this car in 1996, I was on the third head due to cracks in one of the exhaust manifold mounting points that could not be welded (not from lack of trying!). In fall 2000, the bottom half of the engine finally gave up the ghost, going down to about 90 psi in the number-6 cylinder. 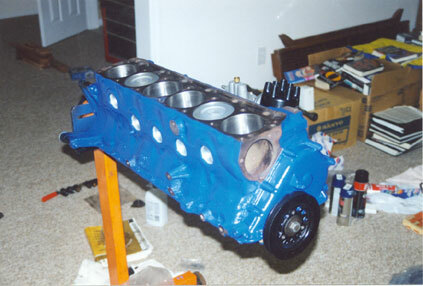 So over the next 12 months, I found and had a 1965 block rebuilt. Of course I couldn't leave well enough alone, so I went with several hop-ups from Clifford Performance, including a hotter cam and an exhaust manifold. Out with the old... 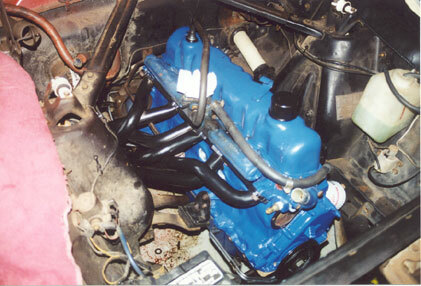 The blue disk is the front of the torque-converter on the transmission. Driver's side view of the new lower-half, freshly painted and with harmonic balancer, distributor and fuel pump installed. 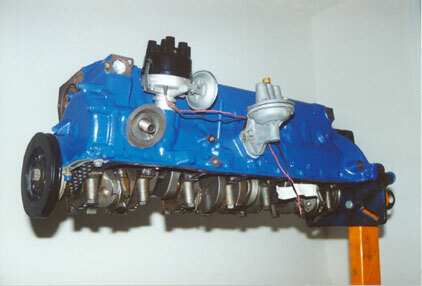 Lower view of the same showing the crank shaft. 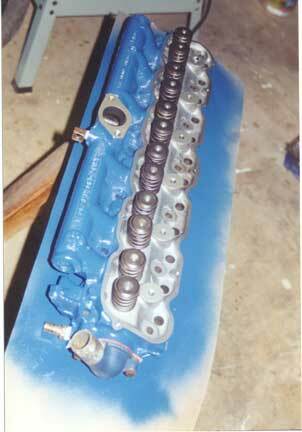 It is said that the crank shaf flexing is one of the performance limiters of these inline-6 engines. Passenger-side front view. Number 2 piston is near the top of it's travel. 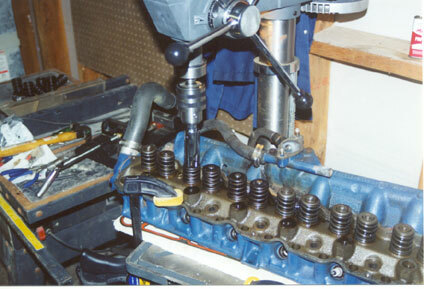 With the hotter cam came the requirement to install stronger valve springs. A tech at NAPA suggested using a large socket in a drill press as a spring compressor. This worked very well (other than the head's tendency to want to fall off the drill press with the end springs). In with the new... New lower half ready to go in. 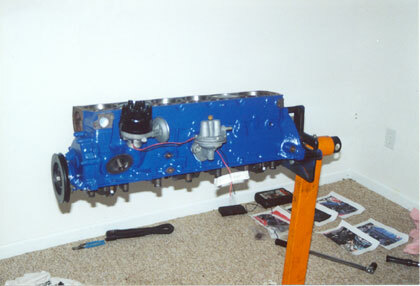 The head is not installed yet due to clearance issues and access when bolting up to the transmission. 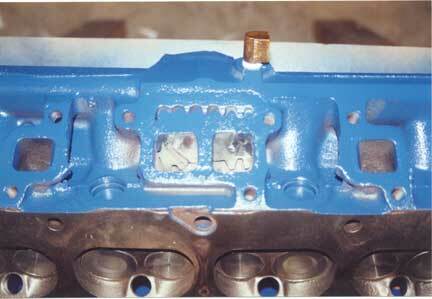 The oil pan is a new reproduction piece. 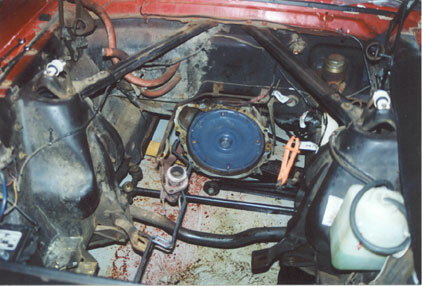 Engine in and bolted up to the transmission. 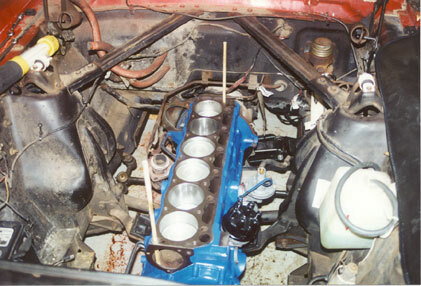 The wooden dowels are to hold the head gasket in place and to guide the head down to the correct location. 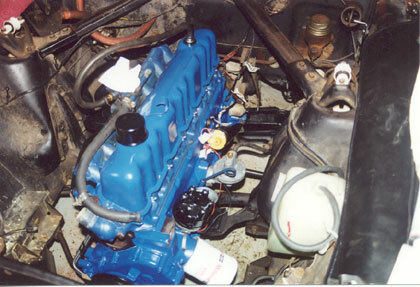 Head and valve cover installed. New 2" black header from Clifford Performance. I didn't go with the fancy heat-resistant coating, as I didn't know how good the part would be and didn't want to spend the money if the quality was poor. However, the header has been great. The only two issues were adjusting the throttle linkage not to hit, and having to muscle the existing 1 1/4" exhaust to the correct location. I hope to have a custom 2" exhaust bent soon. 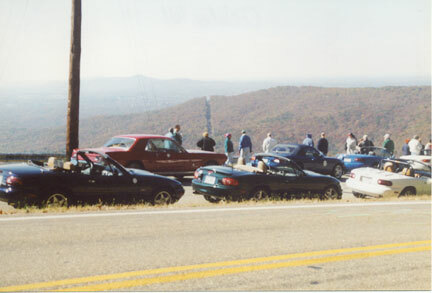 First official test drive was with some of our friends in the Peachtree Miata Club up through the North Georgia mountains. Well, the car had been running okay for the last year or two, but starting having a serious problem idiling. We have an automatic, so a smooth idle is more important than in a stick, as the engine and the transmission are always coupled so any surging or stumbling in the engine causes surging and lurching in the transmission. 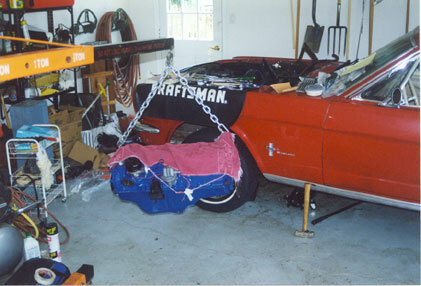 I first tried a new (rebuilt) carburetor, but that just made things worse. Engine compression was okay, and the idle vacuum was on the low side (17 psi), so there wasn't anything obvious wrong. I replaced the distributor cap/rotor and plugs (which seemed to foul every 2-3 days). The exhaust-port divider I bought from Clifford was loose again and rattling around driving me nuts, so this was the final straw and I pulled the head off. Turned out that 10 of the 12 valves were quite a bit undersized and had built up a good amount of gooey residue on the top-side of the valves. So, I threw a wad of money at the head and had NAPA put in new valves and valve guides. The machinist at NAPA talked me out of hardened seats (he said that once hardened ones are put in, there is nothing much you can do when they wear out, so you don't want to do that until the stock seats are beyond use/repair -- guess I'll trust the person who is suppose to know what is going on). 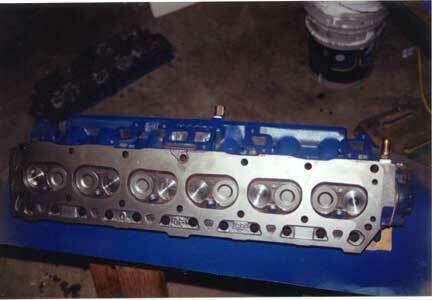 Head after the new valves were put in. Not sure what Walmart did to my pictures to give me so many different shades of blue! Bottom view of the new valves. Clifford's exhaust-port divider. In the past I had tried J-B-Weld and various wedging schemes to hold it in place. This time I bought a used stick-welder on Ebay and welded that sucker in (using cast-iron rod).